Patent Plaques has been creating custom trademark and patent plaques since 1993 – and offers a wide range of patent plaques, patent awards, and IP recognition awards for your company, organization or university. 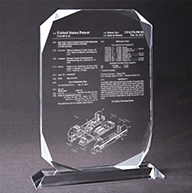 This beautiful, crystal clear, 9" x 11-3/4" x 3/4" acrylic desktop patent award has your patent information laser engraved directly into the acrylic plaque. 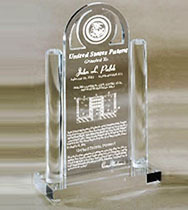 Like all our plaques and awards, each acrylic patent award is handcrafted in house from design to finish. Have a special request or requirement? Let us know! Custom designs are our specialty. 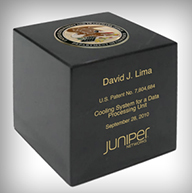 Our beautiful 4" x 4" x 4" patent cubes are artfully engraved which produces a clean, crisp, white graphic. The cube graphics can be left the natural white or can be hand color filled with a rich gold ink. It’s your choice. On the Patent Cube we offer unique option for the top of the Patent Cube. It is a 24k gold-plated United States Patent & Trademark Office Seal medallion with full color enamel detail. This medallion is only available from our PatentPlaques.com. Watch this video to see how we can help you implement your patent plaque program. We realize that our large corporate and academic clients may have special needs and requests. So we have developed corporate programs for those clients which include custom patent plaques, discounts, samples, and even a custom store developed specifically for your company's ease of ordering. Some of our satisfied corporate clients, we would love to have you join the club! Q: Why should I buy my patent plaque for PatentPlaques.com? 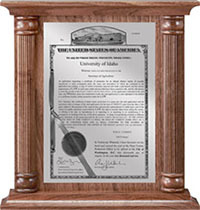 A: Since 1993 we have been producing the highest quality patent plaques on the market. 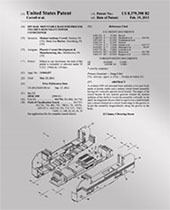 If you are looking for a beautiful memento to mark the issuance of your patent, PatentPlaques.com is your patent plaque supplier. Q: Do I have to place my order online through your website? – 1. PHONE: If you would like to speak to someone and have us take your order over the phone, please give us a call at 1-800-932-1662 ext. 1. 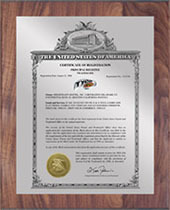 Q: Can I get a patent plaque featuring my International patent? 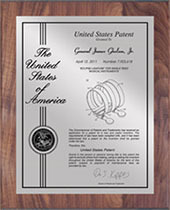 A: YES - Any of our plaque styles can feature your International patent just like our US patent plaques do. When ordering your plaque, just type in the patent number and indicate in which country the patent was issued. We will contact you if there are any questions. Q: Will I see what my patent plaque will look like before I receive it? A: YES - You will receive an artwork proof within 1 business day after placing your order.